Heralded with the ambitious subtitle ‘A Heroic Symphony In Two Parts’, Andrjez Munk’s Eroica is a black comedy that focuses on the notion that the most desperate of situations can bring out the best in people. The film explores the idea by examining the concept of heroes, and what it means to be a hero within the context of Polish culture – the title ‘Eroica’ literally translating in English to ‘heroism’. Comprised of two separate short stories, Munk’s film is loosely structured according to the rules of contrastive musical composition. 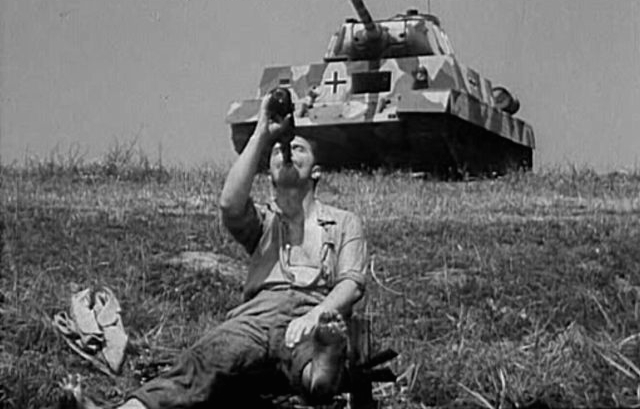 Centred around the Warsaw uprising of 1944, the first of the two stories, entitled Scherzo Alla Pollacca, follows Dzidziuś, a street-savvy drunkard who unwittingly discovers his own sense of duty after he becomes involved in the Home Army. Dzidziuś, a foul-mouthed coward with a grim sense of humour, discovers that his wife is having an affair with a Hungarian officer, and is suddenly thrown into a scheme to advance the cause against the Nazis. There’s an element of the tragicomic to the story, Dzidziuś’ selfish, drunken behaviour juxtaposed with the gravity of the situation and the brutality of the Nazi forces. The second of the stories, entitled Ostinato Lugubre, is set in a Prisoner of War camp for Polish soldiers during the Second World War. Exasperated at his situation, Lt. Zawistowski, one of the inmates, decides to make an escape attempt. Despite not knowing whether he succeeded or failed, Zawistowski’s fellow inmates find inspiration in his efforts, fostering a legend out of the man to boost the prisoners’ morale. There was initially a third segment to Eroica, dubbed Con Bravura, that Munk ultimately decided to cut after deciding that it was too conspicuous a contrast in tone to the first two parts. It was the right decision, since the grimly comic impact of Scherzo Alla Pollacca and Ostinato Lugubre may have been compromised had such a divergent chapter been included. Eroica is one of the most iconic works of one of the most important Polish filmmakers to have ever lived, examining the nation during the it’s darkest era and daring to confront the Polish culture with satire and passion. Eroica is playing as part of ACMI’s Martin Scorsese Presents: Masterpieces of Polish Cinema from Sunday 5 October to Sunday 26 October 2014. For more from ACMI, click here. If you’re digging ReelGood, sign up to our mailing list for exclusive content, early reviews and chances to win big!